Backup your ProStores eCommerce Website with HTTrack Website Copier — Save your HTLM pages and Product Images to your Desktop. ProStores is shutting down on February 1, 2015. Products eventually reach their natural end of life for various reasons, including changes in technologies and marketplace requirements. This is part of any technology product’s lifecycle. Our goal is to help you make a smooth transition to a new eCommerce solution, and to provide as much visibility as possible during the process. This video tutorial illustrates how to use HTTrack to download and backup your ProStores pages in HTML as well as your design and product images. This is especially important for ProStores merchants who utilize the Multi-Image feature and don't have copies of their product image files on their computers. In addition, merchants that added custom pages to the store using ProStores proprietary SSML code will find the HTML rendered versions of the pages useful in recreating them in a new platform as ProStores approaches its EOL on 1 February 2015. 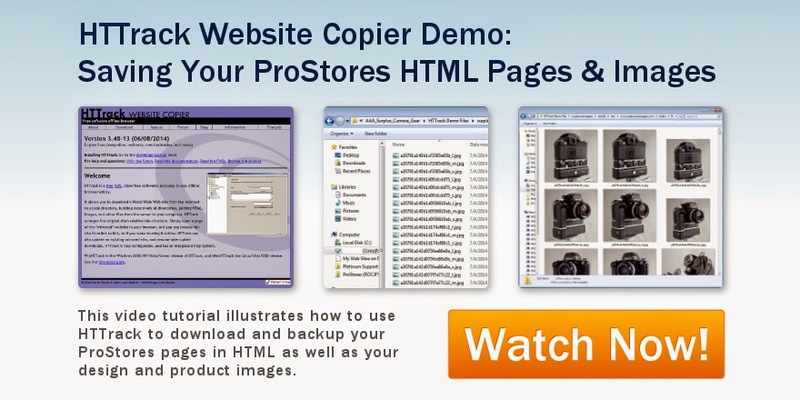 For more information and resources, see HTTrack Website Copier Demo: Saving Your ProStores HTML Pages & Images at Fauxlaroids.com.